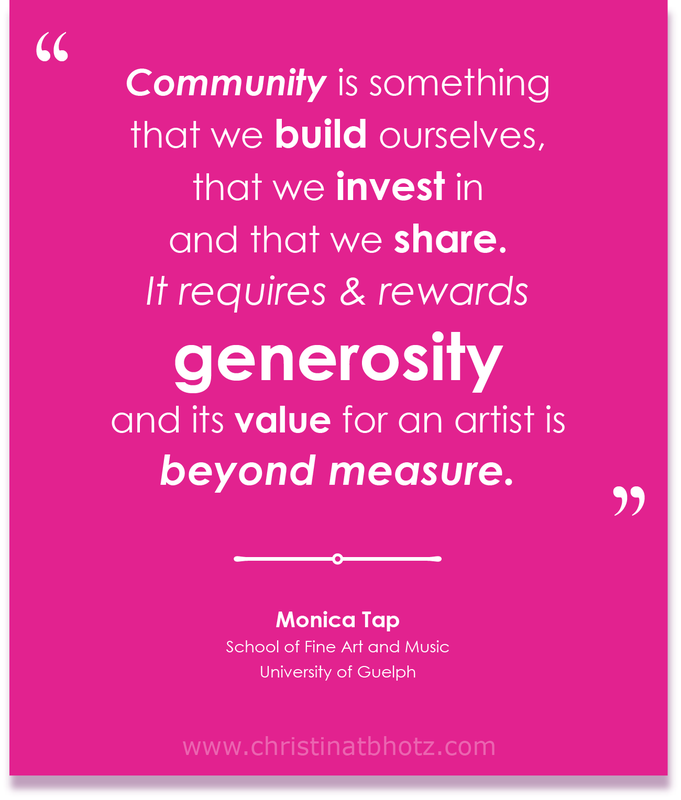 When I was in my last two years of my undergrad at the University of Guelph, several of my professors began to emphasize that one of the most influential and beneficial practices we could learn would be to surround ourselves with a community of artists and creatives. In anticipation of beginning this series on community, I reached out to one of my key mentors and professors from UoG, Monica Tap for her thoughts on the importance of community. Since graduating in 2012, my life has been taken up with things other than making art. From supporting my husband through grad school, starting and raising a family, and some serious soul-searching/self-development, there hasn’t been the broad stretches of time or space to really get into a drawing or painting. I’ve still attended the occasional opening and Shenkman Lecture or taken a wander through Open Studios, but that community of artists that I was inherently part of as a result of Studio Art and Specialized Studios in particular, has for the most part, broken up and moved on without me. It’s only been in the last half year or so that I’ve really come to realize the truth of what my professors were trying to teach me. You can only get so far in any industry without building connections, making friends, and having people to bounce ideas off of. As such, I’ve made a group for young people starting up their own businesses in the Guelph area and have also joined the “Designers of Guelph” group. Although I am not in a place where I have the time (or to be honest, the inclination to make the time) to jump back into the middle of the Art (as opposed to Design) scene, I do want to begin rebuilding that community of support and influence. I’ve also realized that there is no reason not to broaden my support network to include creatives of all types. While having specialized groups to speak to specific problems is good, other creatives have new ways of looking that can be very beneficial even if they don’t work in the same medium. I have always thrived when taking part in discussions about art, music, and creativity in general, so in an attempt to keep my attentions focused on something other than just my own work, I have decided to begin a series of highlighting the work of young creatives in my social circles. I do not claim to be a qualified curator/writer in any respect. This is a personal exercise in writing that hopefully will serve to draw attention to beautiful creations of my contemporaries. The people who have already made it onto my “list” of people to highlight, happen to be people I know/am connected with in some way and who are creating work that I am excited to share and can therefore talk about. I’m beginning this series in a personal manner in part because I know a large number of creatives already, but also because I want to encourage people to look within their own social circles for those young creative people who may be hiding their talents. I also consider it a joy to raise awareness about art/design/music that I personally enjoy — so if you or someone you care about doesn’t happen to be featured, please don’t take it personally — it may be that I find your/their work difficult to write about. If you believe their work should be highlighted, feel free to submit their names along with their website/facebook page and I’ll definitely take it under consideration. Better yet, start your own blog where you write about the work of people who matter to you! Simply put, this makes me happy! Hooray! It makes me happy also!